Start prophylaxis 1 or 2 days before entering a malariaâ€‘endemic area and continue daily during the stay and for 7 days after return. Renal impairment: contraindicated for prophylaxis of P. falciparum malaria in patients with severe renal impairment ( 8.6). MALARONE ® is indicated for the prophylaxis of Plasmodium falciparum malaria, including in areas where chloroquine resistance has been reported. Start prophylactic treatment with MALARONE 1 or 2 days before entering a malariaâ€‘endemic area and continue daily during the stay and for 7 days after return. Each MALARONE Tablet (adult strength) contains 250 mg atovaquone and 100 mg proguanil hydrochloride. MALARONE Tablets are pink, filmâ€‘coated, round, biconvex tablets engraved with â€œGX CM3â€ on one side. Each MALARONE Pediatric Tablet contains 62.5 mg atovaquone and 25 mg proguanil hydrochloride. MALARONE Pediatric Tablets are pink, filmâ€‘coated, round, biconvex tablets engraved with â€œGX CG7â€ on one side. In 3 clinical trials (2 of which were placeboâ€‘controlled) 381 adults (mean age: 31 years) received MALARONE for the prophylaxis of malaria; the majority of adults were black (90%) and 79% were male. In a clinical trial for the prophylaxis of malaria, 125 pediatric patients (mean age: 9 years) received MALARONE; all subjects were black and 52% were male. Adverse experiences reported in adults and pediatric patients, considered attributable to therapy, occurred in similar proportions of subjects receiving MALARONE or placebo in all studies. Prophylaxis with MALARONE was discontinued prematurely due to a treatmentâ€‘related adverse experience in 3 of 381 (0.8%) adults and 0 of 125 pediatric patients. In a placeboâ€‘controlled study of malaria prophylaxis with MALARONE involving 330 pediatric patients (aged 4 to 14 years) in Gabon, a malaria-endemic area, the safety profile of MALARONE was consistent with that observed in the earlier prophylactic studies in adults and pediatric patients. The most common treatmentâ€‘emergent adverse events with MALARONE were abdominal pain (13%), headache (13%), and cough (10%). Abdominal pain (13% vs. 8%) and vomiting (5% vs. 3%) were reported more often with MALARONE than with placebo. No patient withdrew from the study due to an adverse experience with MALARONE. No routine laboratory data were obtained during this study. Nonâ€‘immune travelers visiting a malariaâ€‘endemic area received MALARONE (n = 1,004) for prophylaxis of malaria in 2 active-controlled clinical trials. In one study (n = 493), the mean age of subjects was 33 years and 53% were male; 90% of subjects were white, 6% of subjects were black and the remaining were of other racial/ethnic groups. In the other study (n = 511), the mean age of subjects was 36 years and 51% were female; the majority of subjects (97%) were white. Adverse experiences occurred in a similar or lower proportion of subjects receiving MALARONE than an active comparator (Table 3). Fewer neuropsychiatric adverse experiences occurred in subjects who received MALARONE than mefloquine. Fewer gastrointestinal adverse experiences occurred in subjects receiving MALARONE than chloroquine/proguanil. Compared with active comparator drugs, subjects receiving MALARONE had fewer adverse experiences overall that were attributed to prophylactic therapy (Table 3). Prophylaxis with MALARONE was discontinued prematurely due to a treatmentâ€‘related adverse experience in 7 of 1,004 travelers. In a third activeâ€‘controlled study, MALARONE (n = 110) was compared with chloroquine/proguanil (n = 111) for the prophylaxis of malaria in 221 non-immune pediatric patients (aged 2 to 17 years). The mean duration of exposure was 23 days for MALARONE, 46 days for chloroquine, and 43 days for proguanil, reflecting the different recommended dosage regimens for these products. Fewer patients treated with MALARONE reported abdominal pain (2% vs. 7%) or nausea (<1% vs. 7%) than children who received chloroquine/proguanil. Oral ulceration (2% vs. 2%), vivid dreams (2% vs. <1%), and blurred vision (0% vs. 2%) occurred in similar proportions of patients receiving either MALARONE or chloroquine/proguanil, respectively. Two patients discontinued prophylaxis with chloroquine/proguanil due to adverse events, while none of those receiving MALARONE discontinued due to adverse events. In 7 controlled trials, 436 adolescents and adults received MALARONE for treatment of acute, uncomplicated P. falciparum malaria. The range of mean ages of subjects was 26 to 29 years; 79% of subjects were male. In these studies, 48% of subjects were classified as other racial/ethnic groups, primarily Asian; 42% of subjects were black and the remaining subjects were white. Attributable adverse experiences that occurred in â‰¥5% of patients were abdominal pain (17%), nausea (12%), vomiting (12%), headache (10%), diarrhea (8%), asthenia (8%), anorexia (5%), and dizziness (5%). Treatment was discontinued prematurely due to an adverse experience in 4 of 436 (0.9%) adolescents and adults treated with MALARONE. In 2 controlled trials, 116 pediatric patients (weighing 11 to 40 kg) (mean age: 7 years) received MALARONE for the treatment of malaria. The majority of subjects were black (72%); 28% were of other racial/ethnic groups, primarily Asian. Attributable adverse experiences that occurred in â‰¥5% of patients were vomiting (10%) and pruritus (6%). Vomiting occurred in 43 of 319 (13%) pediatric patients who did not have symptomatic malaria but were given treatment doses of MALARONE for 3 days in a clinical trial. The design of this clinical trial required that any patient who vomited be withdrawn from the trial. Among pediatric patients with symptomatic malaria treated with MALARONE, treatment was discontinued prematurely due to an adverse experience in 1 of 116 (0.9%). In a study of 100 pediatric patients (5 to <11 kg body weight) who received MALARONE for the treatment of uncomplicated P. falciparum malaria, only diarrhea (6%) occurred in â‰¥5% of patients as an adverse experience attributable to MALARONE. In 3 patients (3%), treatment was discontinued prematurely due to an adverse experience. One active-controlled trial evaluated the treatment of malaria in Thai adults (n = 182); the mean age of subjects was 26 years (range: 15 to 63 years); 80% of subjects were male. Early elevations of ALT and AST occurred more frequently in patients treated with MALARONE (n = 91) compared with patients treated with an active control, mefloquine (n = 91). On Day 7, rates of elevated ALT and AST with MALARONE and mefloquine (for patients who had normal baseline levels of these clinical laboratory parameters) were ALT 26.7% vs. 15.6%; AST 16.9% vs. 8.6%, respectively. By Day 14 of this 28â€‘day study, the frequency of transaminase elevations equalized across the 2 groups. Allergic reactions including anaphylaxis, angioedema, and urticaria, and vasculitis. Concomitant administration of atovaquone and indinavir did not result in any change in the steadyâ€‘state AUC and C max of indinavir but resulted in a decrease in the C trough of indinavir [see Clinical Pharmacology (12.3)]. Caution should be exercised when prescribing atovaquone with indinavir due to the decrease in trough concentrations of indinavir. A pre- and post-natal study in Sprague-Dawley rats revealed no adverse effects at doses up to 16 mg/kg/day of proguanil hydrochloride (up to 0.04 times the average human exposure based on AUC). Pre- and post-natal studies of proguanil in animals at exposures similar to or greater than those observed in humans have not been conducted. There are no adequate and wellâ€‘controlled studies of atovaquone and/or proguanil hydrochloride in pregnant women. MALARONE should be used during pregnancy only if the potential benefit justifies the potential risk to the fetus. The proguanil component of MALARONE acts by inhibiting the parasitic dihydrofolate reductase [see Clinical Pharmacology (12.1)]. However, there are no clinical data indicating that folate supplementation diminishes drug efficacy. For women of childbearing age receiving folate supplements to prevent neural tube birth defects, such supplements may be continued while taking MALARONE. MALARONE (atovaquone and proguanil hydrochloride) Tablets (adult strength) and MALARONE (atovaquone and proguanil hydrochloride) Pediatric Tablets, for oral administration, contain a fixedâ€‘dose combination of the antimalarial agents atovaquone and proguanil hydrochloride. Each MALARONE Tablet (adult strength) contains 250 mg of atovaquone and 100 mg of proguanil hydrochloride and each MALARONE Pediatric Tablet contains 62.5 mg of atovaquone and 25 mg of proguanil hydrochloride. The inactive ingredients in both tablets are lowâ€‘substituted hydroxypropyl cellulose, magnesium stearate, microcrystalline cellulose, poloxamer 188, povidone K30, and sodium starch glycolate. The tablet coating contains hypromellose, polyethylene glycol 400, polyethylene glycol 8000, red iron oxide, and titanium dioxide. Atovaquone is a highly lipophilic compound with low aqueous solubility. The bioavailability of atovaquone shows considerable interâ€‘individual variability. Dietary fat taken with atovaquone increases the rate and extent of absorption, increasing AUC 2 to 3 times and C max 5 times over fasting. The absolute bioavailability of the tablet formulation of atovaquone when taken with food is 23%. MALARONE should be taken with food or a milky drink. In a study where 14Câ€‘labeled atovaquone was administered to healthy volunteers, greater than 94% of the dose was recovered as unchanged atovaquone in the feces over 21 days. There was little or no excretion of atovaquone in the urine (less than 0.6%). There is indirect evidence that atovaquone may undergo limited metabolism; however, a specific metabolite has not been identified. Between 40% to 60% of proguanil is excreted by the kidneys. 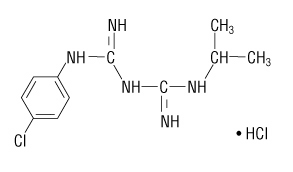 Proguanil is metabolized to cycloguanil (primarily via CYP2C19) and 4-chlorophenylbiguanide. The main routes of elimination are hepatic biotransformation and renal excretion. The elimination halfâ€‘life of atovaquone is about 2 to 3 days in adult patients. The elimination halfâ€‘life of proguanil is 12 to 21 hours in both adult patients and pediatric patients, but may be longer in individuals who are slow metabolizers. A population pharmacokinetic analysis in adult and pediatric patients showed that the apparent clearance (CL/F) of both atovaquone and proguanil is related to the body weight. The values CL/F for both atovaquone and proguanil in subjects with body weight â‰¥11 kg are shown in Table 4. The pharmacokinetics of proguanil and cycloguanil are similar in adult patients and pediatric patients. However, the elimination halfâ€‘life of atovaquone is shorter in pediatric patients (1 to 2 days) than in adult patients (2 to 3 days). In clinical trials, plasma trough concentrations of atovaquone and proguanil in pediatric patients weighing 5 to 40 kg were within the range observed in adults after dosing by body weight. In a singleâ€‘dose study, the pharmacokinetics of atovaquone, proguanil, and cycloguanil were compared in 13 elderly subjects (aged 65 to 79 years) with those of 13 younger subjects (aged 30 to 45 years). In the elderly subjects, the extent of systemic exposure (AUC) of cycloguanil was increased (point estimate = 2.36, 90% CI = 1.70, 3.28). T max was longer in elderly subjects (median: 8 hours) compared with younger subjects (median 4 hours) and average elimination halfâ€‘life was longer in elderly subjects (mean: 14.9 hours) compared with younger subjects (mean 8.3 hours). In patients with mild renal impairment (creatinine clearance 50 to 80 mL/min), oral clearance and/or AUC data for atovaquone, proguanil, and cycloguanil are within the range of values observed in patients with normal renal function (creatinine clearance >80 mL/min). In patients with moderate renal impairment (creatinine clearance 30 to 50 mL/min), mean oral clearance for proguanil was reduced by approximately 35% compared with patients with normal renal function (creatinine clearance >80 mL/min) and the oral clearance of atovaquone was comparable between patients with normal renal function and mild renal impairment. No data exist on the use of MALARONE for long-term prophylaxis (over 2 months) in individuals with moderate renal failure. In patients with severe renal impairment (creatinine clearance <30 mL/min), atovaquone C max and AUC are reduced but the elimination halfâ€‘lives for proguanil and cycloguanil are prolonged, with corresponding increases in AUC, resulting in the potential of drug accumulation and toxicity with repeated dosing [see Contraindications (4.2)]. In a singleâ€‘dose study, the pharmacokinetics of atovaquone, proguanil, and cycloguanil were compared in 13 subjects with hepatic impairment (9 mild, 4 moderate, as indicated by the Childâ€‘Pugh method) with those of 13 subjects with normal hepatic function. In subjects with mild or moderate hepatic impairment as compared with healthy subjects, there were no marked differences (<50%) in the rate or extent of systemic exposure of atovaquone. However, in subjects with moderate hepatic impairment, the elimination halfâ€‘life of atovaquone was increased (point estimate = 1.28, 90% CI = 1.00 to 1.63). Proguanil AUC, C max, and its elimination half-life increased in subjects with mild hepatic impairment when compared with healthy subjects (Table 5). Also, the proguanil AUC and its elimination half-life increased in subjects with moderate hepatic impairment when compared with healthy subjects. Consistent with the increase in proguanil AUC, there were marked decreases in the systemic exposure of cycloguanil (C max and AUC) and an increase in its elimination halfâ€‘life in subjects with mild hepatic impairment when compared with healthy volunteers (Table 5). There were few measurable cycloguanil concentrations in subjects with moderate hepatic impairment. The pharmacokinetics of atovaquone, proguanil, and cycloguanil after administration of MALARONE have not been studied in patients with severe hepatic impairment. Atovaquone is highly protein bound (>99%) but does not displace other highly proteinâ€‘bound drugs in vitro. Indinavir: Concomitant administration of atovaquone (750 mg twice daily with food for 14 days) and indinavir (800 mg three times daily without food for 14 days) did not result in any change in the steadyâ€‘state AUC and C max of indinavir but resulted in a decrease in the C trough of indinavir (23% decrease [90% CI = 8%, 35%]). 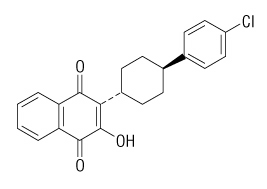 Atovaquone and cycloguanil (an active metabolite of proguanil) are active against the erythrocytic and exoerythrocytic stages of Plasmodium spp. Enhanced efficacy of the combination compared with either atovaquone or proguanil hydrochloride alone was demonstrated in clinical trials in both immune and non-immune patients [see Clinical Studies (14.1, 14.2)]. A 24â€‘month carcinogenicity study in CD rats was negative for neoplasms at doses up to 500 mg/kg/day corresponding to approximately 54 times the average steady-state plasma concentrations in humans during prophylaxis of malaria. In CD-1 mice, a 24â€‘month study showed treatmentâ€‘related increases in incidence of hepatocellular adenoma and hepatocellular carcinoma at all doses tested (50, 100, and 200 mg/kg/day) which correlated with at least 15 times the average steadyâ€‘state plasma concentrations in humans during prophylaxis of malaria. No evidence of a carcinogenic effect was observed in 24â€‘month studies conducted in CD-1 mice at doses up to 16 mg/kg/day corresponding to 1.5 times the average human plasma exposure during prophylaxis of malaria based on AUC, and in Wistar Hannover rats at doses up 20 mg/kg/day corresponding to 1.1 times the average human plasma exposure during prophylaxis of malaria based on AUC. A fertility study in Sprague-Dawley rats revealed no adverse effects at doses up to 16 mg/kg/day of proguanil hydrochloride (up to 0.04 times the average human exposure during treatment of malaria based on AUC). Fertility studies of proguanil in animals at exposures similar to or greater than those observed in humans have not been conducted. Fibrovascular proliferation in the right atrium, pyelonephritis, bone marrow hypocellularity, lymphoid atrophy, and gastritis/enteritis were observed in dogs treated with proguanil hydrochloride for 6 months at a dose of 12 mg/kg/day (approximately 3.9 times the recommended daily human dose for malaria prophylaxis on a mg/m 2 basis). Bile duct hyperplasia, gall bladder mucosal atrophy, and interstitial pneumonia were observed in dogs treated with proguanil hydrochloride for 6 months at a dose of 4 mg/kg/day (approximately 1.3 times the recommended daily human dose for malaria prophylaxis on a mg/m 2 basis). Mucosal hyperplasia of the cecum and renal tubular basophilia were observed in rats treated with proguanil hydrochloride for 6 months at a dose of 20 mg/kg/day (approximately 1.6 times the recommended daily human dose for malaria prophylaxis on a mg/m 2 basis). Adverse heart, lung, liver, and gall bladder effects observed in dogs and kidney effects observed in rats were not shown to be reversible. MALARONE was evaluated for prophylaxis of P. falciparum malaria in 5 clinical trials in malariaâ€‘endemic areas and in 3 activeâ€‘controlled trials in nonâ€‘immune travelers to malariaâ€‘endemic areas. Three placeboâ€‘controlled trials of 10 to 12 weeksâ€™ duration were conducted among residents of malariaâ€‘endemic areas in Kenya, Zambia, and Gabon. The mean age of subjects was 30 (range: 17 to 55), 32 (range: 16 to 64), and 10 (range: 5 to 16) years, respectively. Of a total of 669 randomized patients (including 264 pediatric patients aged 5 to 16 years), 103 were withdrawn for reasons other than falciparum malaria or drugâ€‘related adverse events (55% of these were lost to followâ€‘up and 45% were withdrawn for protocol violations). The results are listed in Table 6.
a Free of parasitemia during the 10 to 12-week period of prophylactic therapy. In another study, 330 Gabonese pediatric patients (weighing 13 to 40 kg, and aged 4 to 14 years) who had received successful openâ€‘label radical cure treatment with artesunate, were randomized to receive either MALARONE (dosage based on body weight) or placebo in a doubleâ€‘blind fashion for 12 weeks. Blood smears were obtained weekly and any time malaria was suspected. Nineteen of the 165 children given MALARONE and 18 of 165 patients given placebo withdrew from the study for reasons other than parasitemia (primary reason was lost to follow-up). One out of 150 evaluable patients (<1%) who received MALARONE developed P. falciparum parasitemia while receiving prophylaxis with MALARONE compared with 31 (22%) of the 144 evaluable placebo recipients. In a 10â€‘week study in 175 South African subjects who moved into malariaâ€‘endemic areas and were given prophylaxis with 1 MALARONE Tablet daily, parasitemia developed in 1 subject who missed several doses of medication. Since no placebo control was included, the incidence of malaria in this study was not known. Two active-controlled trials were conducted in nonâ€‘immune travelers who visited a malariaâ€‘endemic area. The mean duration of travel was 18 days (range: 2 to 38 days). Of a total of 1,998 randomized patients who received MALARONE or controlled drug, 24 discontinued from the study before follow-up evaluation 60 days after leaving the endemic area. Nine of these were lost to follow-up, 2 withdrew because of an adverse experience, and 13 were discontinued for other reasons. These trials were not large enough to allow for statements of comparative efficacy. In addition, the true exposure rate to P. falciparum malaria in both trials is unknown. The results are listed in Table 7. A third randomized, openâ€‘label study was conducted which included 221 otherwise healthy pediatric patients (weighing â‰¥11 kg and aged 2 to 17 years) who were at risk of contracting malaria by traveling to an endemic area. The mean duration of travel was 15 days (range 1 to 30 days). Prophylaxis with MALARONE (n = 110, dosage based on body weight) began 1 or 2 days before entering the endemic area and lasted until 7 days after leaving the area. A control group (n = 111) received prophylaxis with chloroquine/proguanil dosed according to WHO guidelines. No cases of malaria occurred in either group of children. However, the study was not large enough to allow for statements of comparative efficacy. In addition, the true exposure rate to P. falciparum malaria in this study is unknown. In separate trials with small numbers of volunteers, atovaquone and proguanil hydrochloride were independently shown to have causal prophylactic activity directed against liverâ€‘stage parasites of P. falciparum. Six patients given a single dose of atovaquone 250 mg 24 hours prior to malaria challenge were protected from developing malaria, whereas all 4 placeboâ€‘treated patients developed malaria. During the 4 weeks following cessation of prophylaxis in clinical trial participants who remained in malariaâ€‘endemic areas and were available for evaluation, malaria developed in 24 of 211 (11.4%) subjects who took placebo and 9 of 328 (2.7%) who took MALARONE. While new infections could not be distinguished from recrudescent infections, all but 1 of the infections in patients treated with MALARONE occurred more than 15 days after stopping therapy. The single case occurring on Day 8 following cessation of therapy with MALARONE probably represents a failure of prophylaxis with MALARONE. In 3 Phase 2 clinical trials, atovaquone alone, proguanil hydrochloride alone, and the combination of atovaquone and proguanil hydrochloride were evaluated for the treatment of acute, uncomplicated malaria caused by P. falciparum. Among 156 evaluable patients, the parasitological cure rate (elimination of parasitemia with no recurrent parasitemia during followâ€‘up for 28 days) was 59/89 (66%) with atovaquone alone, 1/17 (6%) with proguanil hydrochloride alone, and 50/50 (100%) with the combination of atovaquone and proguanil hydrochloride. MALARONE was evaluated for treatment of acute, uncomplicated malaria caused by P. falciparum in 8 Phase 3 randomized, open-label, controlled clinical trials (N = 1,030 enrolled in both treatment groups). The mean age of subjects was 27 years and 16% were children 12 years and younger; 74% of subjects were male. Evaluable patients included those whose outcome at 28 days was known. Among 471 evaluable patients treated with the equivalent of 4 MALARONE Tablets once daily for 3 days, 464 had a sensitive response (elimination of parasitemia with no recurrent parasitemia during followâ€‘up for 28 days) (Table 8). Seven patients had a response of RI resistance (elimination of parasitemia but with recurrent parasitemia between 7 and 28 days after starting treatment). In these trials, the response to treatment with MALARONE was similar to treatment with the comparator drug in 4 trials. a MALARONE = 1,000 mg atovaquone and 400 mg proguanil hydrochloride (or equivalent based on body weight for patients weighing â‰¤40 kg) once daily for 3 days. b Elimination of parasitemia with no recurrent parasitemia during followâ€‘up for 28 days. c Patients hospitalized only for acute care. Followâ€‘up conducted in outpatients. When these 8 trials were pooled and 2 additional trials evaluating MALARONE alone (without a comparator arm) were added to the analysis, the overall efficacy (elimination of parasitemia with no recurrent parasitemia during followâ€‘up for 28 days) in 521 evaluable patients was 98.7%. The efficacy of MALARONE in treating acute uncomplicated P. falciparum malaria in children weighing â‰¥5 and <11 kg was examined in an openâ€‘label, randomized trial conducted in Gabon. 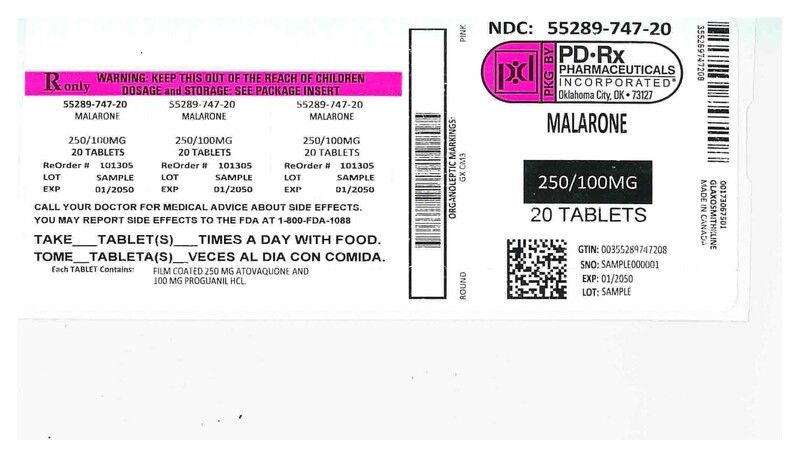 Patients received either MALARONE (2 or 3 MALARONE Pediatric Tablets once daily depending upon body weight) for 3 days (n = 100) or amodiaquine (10 mg/kg/day) for 3 days (n = 100). In this study, the MALARONE Tablets were crushed and mixed with condensed milk just prior to administration. An adequate clinical response (elimination of parasitemia with no recurrent parasitemia during followâ€‘up for 28 days) was obtained in 95% (87/92) of the evaluable pediatric patients who received MALARONE and in 53% (41/78) of those evaluable who received amodiaquine. A response of RI resistance (elimination of parasitemia but with recurrent parasitemia between 7 and 28 days after starting treatment) was noted in 3% and 40% of the patients, respectively. Two cases of RIII resistance (rising parasite count despite therapy) were reported in the patients receiving MALARONE. There were 4 cases of RIII in the amodiaquine arm. that no chemoprophylactic regimen is 100% effective; therefore, patients should seek medical attention for any febrile illness that occurs during or after return from a malariaâ€‘endemic area and inform their healthcare professional that they may have been exposed to malaria. MALARONE is a registered trademark of the GSK group of companies. Store at 25 oC (77 oF); excursions permitted to 15 o to 30 oC (59 o to 86 oF) (see USP Controlled Room Temperature).